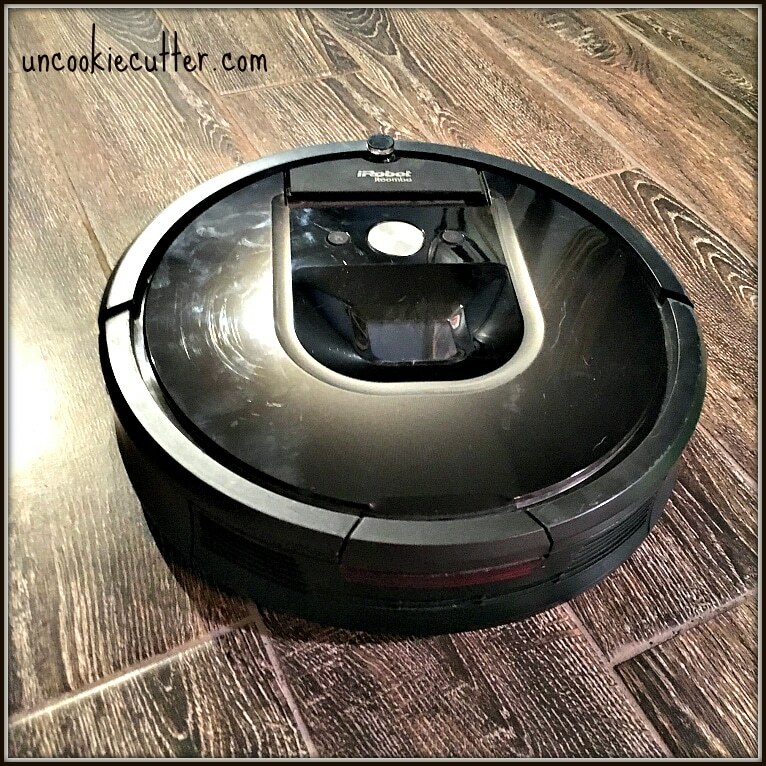 This is my Roomba review, because I get so many questions about it! I love it, but it’s not for everybody! 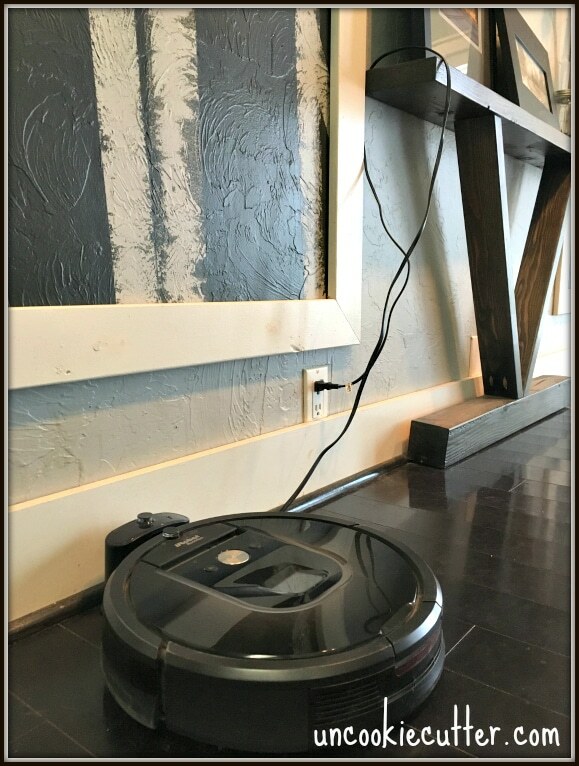 I decided to write a little “Roomba review” for those of you wondering the question I always get asked – do I like my Roomba? I do love it, but I also think it’s not for everybody. Here are all the pros and cons I’ve experienced with this thing. Let me explain what prompted the Roomba purchase. We have 3 dogs that shed, 2 kids and black floors. When we looked at the house before we bought it, we kept saying “what beautiful floors”! I get that comment on the blog as well. A single bachelor lived in this house with no kids and no dogs. I’m sure for that guy the black floors were a great choice. For us, it’s like the seventh level of hell. If you think white shows more than black, I will politely disagree. We had white floors at our last home and the black shows SO MUCH MORE. Every dog hair, in every color, every spec of dust and every single spot of dirt. I had two trustworthy friends who had a Roomba when our old vacuum broke and they highly recommended them, so we decided to splurge and try it out. Here is what my floors looked like all the time. This post is a non-sponsored post. I wrote this because I was asked about the Roomba so often. It does contain affiliate links, which you can read more about HERE. 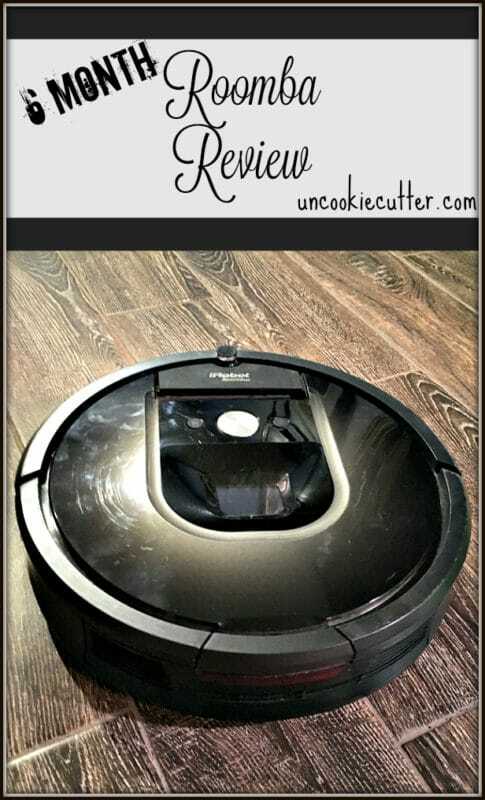 So, if you are looking for a quick roomba review here it is. I would buy it again in a heartbeat. It has made my life so much better. Seriously, for us, it was totally worth the quality of life improvement. However, it’s not without its issues, which I will discuss further the highs and lows. Just so you know, I bought the Roomba 980, which has an app that the other ones don’t. My two friends that recommended the Roomba have earlier versions and still love it. So, read my review but if you feel like you can live without the app, it will save you (literally) hundreds of dollars. So, I’m going to tell you about the cons first, then I’ll tell you why it’s worth it. It may not be the best for some people and here is why. It’s loud. No positive way to spin this, it is just loud. The only good thing about it being loud is if it stops I know it. Roomba is set up to clean the whole house, but this doesn’t work for us. We bought a 4,300 square foot ranch and it runs all day, but each morning I have to move it to a different spot. The layout here is kind of funky, and if we didn’t have so much for it to clean, I’m sure it would be able to handle the whole house. But, since it goes back over things that it doesn’t get the first time, it takes it forever. Moving it every day ensures that it gets about 3/4 of the house each day, so there are many days in a row that the same area gets clean, but then that area misses a day. It doesn’t go over liquids, but will go over other things. One of our pups is 16 and she still tries to make out the dog door in time, but sometimes she doesn’t quite get there. So, if you aren’t sure what I mean, read THIS post and then you will see what I am talking about. This guy is NOT lying. There was poop everywhere and the smell, oh man. I was able to clean mine, unlike this guy, but it totally sucked. So, if you work outside the home and have an indoor dog, this might not be the best for you. Unless your dog is totally great about getting outside like our other two. If it has a problem, or the bin gets too full, it stops. If you don’t get to it within 90 minutes it cancels the job and you have to start it over when you get to it. This isn’t that bad, but it does kind of stink from time to time. I wish there it would pick up again where it left off, no matter how long it took me to clear it out. The dust bin has to be emptied a lot. It’s much better now that I have it running every day, but at first, it filled up pretty quickly. Have I mentioned we have a lot of hair and dirt in here??? Now that we run it every day, I probably have to empty the bin 2-3 times per day. And it runs ALL DAY. It makes me feel gross that there is that much hair, but the great thing is that it makes me feel better that it’s gone. There is no attachments, so you can’t clean the couches/stairs with it. I just use my Shark handheld on the couches, which works great. It’s own cord can sometimes get in the way. Not a huge deal, but I do usually have to drape it over a nearby piece of furniture or wrap it up. So, with all this, you might wonder why I’d trade my husband I like it so much. Here is why I would buy it again. We have a lot of black floors, and they seemed to go on for miles when I was sweeping them every day. The problem with sweeping them is that the hair and dust just sort of float around and settle back onto the floor. The Roomba’s suction is actually very good and it does a great job picking things up. I was actually surprised at how well it picks up. It goes under the furniture. This is so awesome, you guys. Everything is so much cleaner all the time now. The first time it went under the couch it pushed out all the toys and whatnot and now that it goes every day, the house just feels cleaner. Dusting isn’t my strong suit, so I love that it goes under everything so well. There are a few cabinets that it gets stuck on sometimes, but everything else hasn’t been a problem. Hopefully, soon we rip these ugly cabinets out, and when we do, we will redesign ones that are high enough to fit the Roomba underneath. She goes over different floor types seamlessly. Rugs, carpet, hardwood and tile – we have it all and the transition is great. Roomba also comes with little lighthouses that set up in a second and form an invisible barrier if you don’t want it to go somewhere. There is this fun little spinny brush that sticks out and gets corners and around furniture legs wonderfully. It’s hard to tell how the round shape can clean those areas, but it works great. I love the app. I can check it too see what’s happing, turn it on and off, set a schedule, and pause it if I need too. It makes it easy to set it to come on, even if I forget. I try to move it to a new location every morning, but even if I forget, it still comes on and still cleans most of the house. Plus, I can use the app to locate it when I lose it. Sometimes she gets stuck under a couch or the aforementioned cabinets. If you get the app, you get to name it and ours is named Liz Lemon. Whenever anyone hears her coming we all yell “here comes Liz Lemon” in our most Ophra-y voice. This will all make sense if you go watch the episode of 30 Rock where Liz Lemon meets Oprah on the plane. It’s good family fun, but I digress. I thought it would be a pain with little things and cords and whatnot, but it stops itself if something is caught in it, which is nice because that prevents it from breaking. Unlike my old vacuum that I would push to the absolute limit on what I could do, this self-corrects itself. So, it will not start again until I fix the problem. After the first week or so, it hardly gets stuck at all anymore. The house is so much cleaner. That is the bottom line. This thing is expensive, but we got rid of our cleaning service to buy this, which is way cheaper after 6 months and honestly, it does a better job. The cleaning service (2 different ones) could not clean my floors. Okay, so there is my Roomba review. Expensive? Yes. But, I would buy it again. It’s worth it for us. What do you guys think? Do you have one? I have heard the earlier versions were not great at picking stuff up, but mine does a great job. 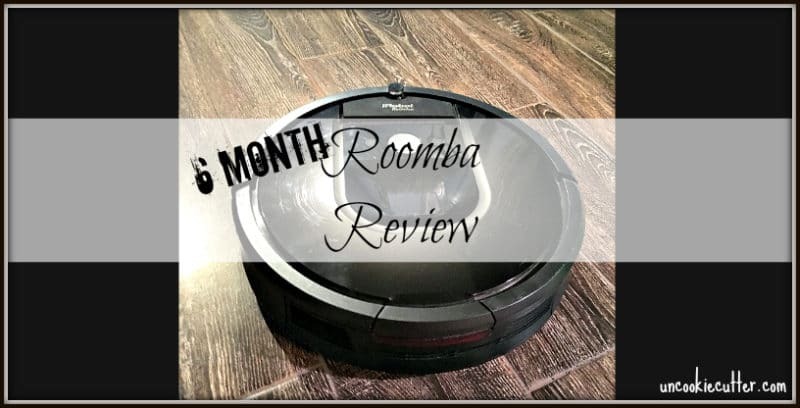 Let me know if you have any questions, or if I missed anything in my Roomba Review and I’ll do my best to answer them for you. I purchased mine off Amazon – Here – and haven’t had any problems, cause it’s Amazon. You can read a ton more reviews there. I have a roomba, it is a lifesaver when the dog is shedding! HAha, that was a tough one for me too :). But, I really do love it! I gave him the “it’s as useful as a dishwasher” argument. And I do think that’s true! Good luck. It really is, especially when your floors need to be clean for photo shoots :). I’ve wanted a Roomba for forever!!! I need to just buckle down and do it – of course, did you see that horror story about the Roomba that ran into dog poop?? Can’t even imagine! Yes, I actually linked to it above! It happened to me – awful! That was a “con” for sure, haha. Still love it though! I thought I have seen it all and this is amazing, I think its great for families. I love your honesty about the pros and con, great review. Its probably not a bad idea for me since i have 4 cats. It is great for picking up animal hair! I totally agree! I just think of it as an appliance. I’ve spent more on lesser appliances for sure. Thanks for stopping by Lesley! I am so glad you mentioned the poop story, I died when reading that on facebook! I would love to try a roomba! Maybe I’ll put it on my Christmas list! It is my fav appliance!! Even with the dog poop :). Have a great weekend Amanda! Haha, well I hope it was helpful :). I have been wondering this for so long because we have 2 large dogs (white fur of course and cherry floors). I could spend hours manually sweeping and I hate it! The price is what has mostly prevented me from getting one. I was surprised though because I thought they were cordless. Is that just for charging or do they actually have a cord? No, that is just for charging. That is the dock. She returns home to charge and then heads back out to finish the job. Sometimes when she gets close to the dock, the cord gets in the way a bit. I wish it was retractable, but no big deal. My Roomba i7 is docked on carpet and I just tucked the cord in along the wall. Can’t even see it. Maybe you could dock yours on a small rug and hide the cord under it. I have always wanted one, but didn’t know if they really worked. Glad to see this review. Ok, I never was tempted to buy a Roomba before because I doubted they could actually work, but I am going to keep it on my radar now! 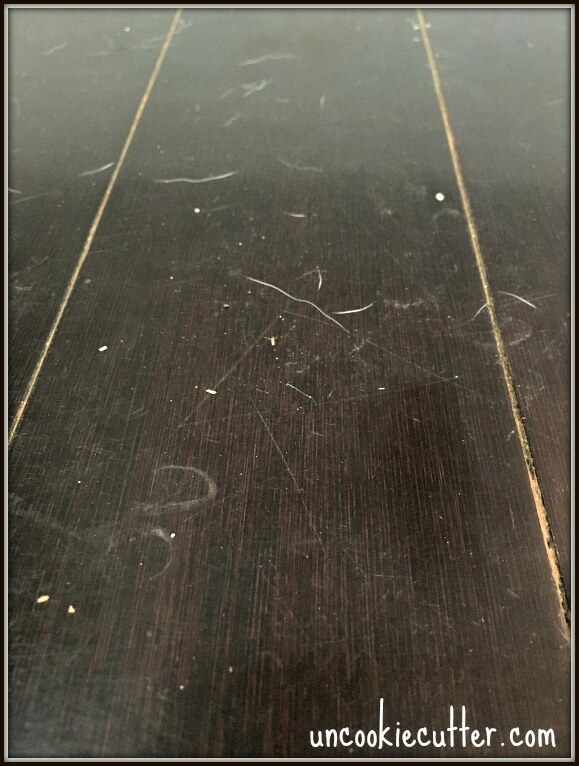 We have semi dark floors, and I hate how much dog hair, dander, and dust you can see on them – no matter what. Maybe this will be a solution. Pinning! Dark floors are the worst! Thanks for stopping by Jenny! Thanks for this review. I keep telling my husband I need one, we too have dark floors and a dog. Pinned! Still on my “want” list! 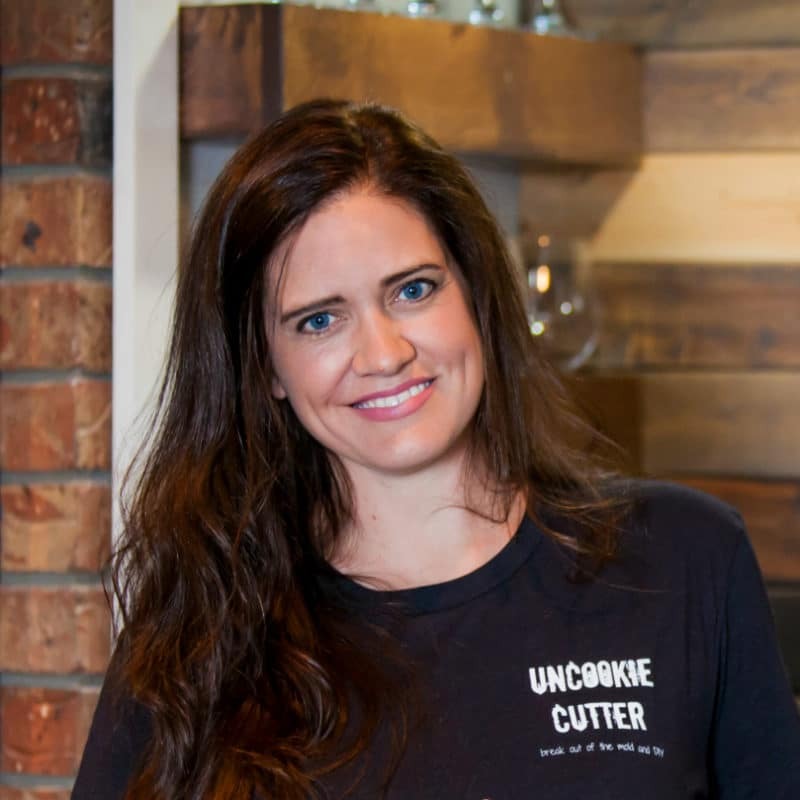 Love your review! We bought one for my grandma for Christmas and it’s amazing. I want one for my own home. Thanks Amy! Totally worth it! This looks like a wonderful thing to use to keep your floors clean without having to work as hard. We tried one of these one time, but with our floors being uneven it didn’t work out to well. Good to know Crystal! I’ve heard they’ve gotten better, but still not sure about uneven floors. Thanks for stopping by! First, I read that gent’s story about the pup poop and as horrible as it was I laughed until I cried. I just can’t imagine…… That being said, I have a Roomba (named Gretchen – because I do talk to it. Hubby says I need to get out more) and I absolutely love it. My 3 beagle kids give it a good workout. 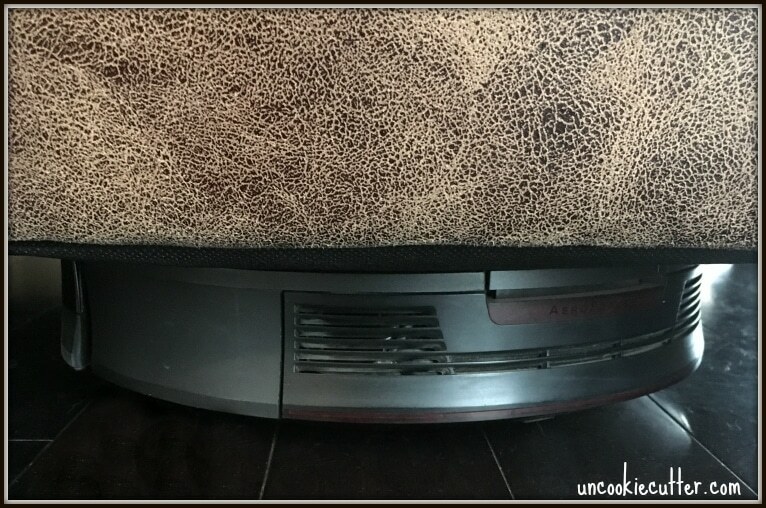 Do I depend on it to do thorough, deep clean vacuuming? No. But it does a great job at keeping my tile, carpet and wood flooring relatively dog hair tumbleweed free. 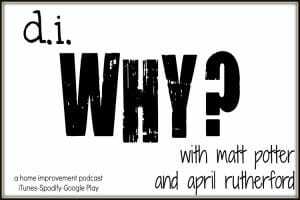 I can’t tell you how much time it saves me, which is important because I usually have at least 48 other projects lined up jockeying for priority. If your budget will accommodate – get one! I totally agree! And that pup story had me rolling because I could relate all too well! !